This book assesses the attempt to establish a modern system of democratic government in Thailand against the background of Thai politics and culture. The fact that since 1932, when it became a constitutional monarchy, Thailand has had 18 constitutions speaks of an unstable political system which has seen rapid and repeated fluctuations between military rule and elected government. The main focus of this study is a critical discussion of the institutional frameworks which have been established under recent constitutions. Individual chapters deal with: Thai history and context, including the role of the monarchy and the military, and of constitutional drafting processes; parliament and elections; the executive branch of government, including the role of ministers, the civil service, of a contracting state and of anti-corruption initiatives; the structure and challenges of local government, including discussion of the southern insurgency; the Constitutional Court and constitutional enforcement; the constitutional role of administrative law and of the administrative courts; the constitutional protection of human rights, with freedom of speech as a particular case study. 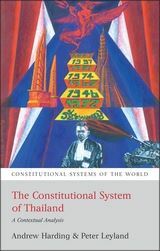 “Authors Professor Andrew Harding and Professor Peter Leyland have made a good attempt to comprehensively describe and critique the constitutional system of the Kingdom of Thailand and this is a unique contribution to introductory resources on Thai constitutionalism in the English language. The series itself makes an impressive contribution to comparative constitutional law scholarship, and this volume assists the English reader unable to read primary legal material in Thai to access a useful introduction to the history and contemporary functioning of Thai constitutionalism. 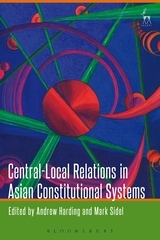 ...a unique, readable and well-referenced introduction, and is highly valuable for the novice scholar of Thai constitutional law and the experienced specialist alike. “With eighteen different constitutions, in the space of eighty years, writing a book about the constitutional system of Thailand is a daunting task. This volume rises to the challenge effectively, providing a comprehensive analysis of Thailand's governing system, including both specific constitutional provisions and the broader parliamentary, administrative and judicial context. Legal discussion is nicely integrated with even-handed political analysis. This is an invaluable resource for scholars of Thai politics, administration and law. There is plenty of constitutional detail and comparison of different approaches in various charters, but not so much that the reader is swamped. Detailed tables of legal cases, statutes, constitutional sections, treaties and decrees at the beginning of the book enhance its accessibility and usefulness as a reference volume. “Andrew Harding and Peter Leyland must be applauded for having delivered an easily accessible, balanced and comprehensive account of the Thai constitutional system – a first in English. This is an ambitious study, striding confidently across the varying fields of history, politics and legal scholarship. 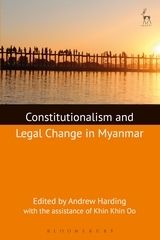 Given the considerable country expertise of the two authors, their careful referencing, and their suggestions for further readings (in Thai and English) at the end of each chapter, this book leaves little for readers to wish for, particularly those readers seeking an accessible introduction to a complex subject. The book should also offer useful insights for a wider audience not otherwise drawn by the title of the book because the authors have a broad concept of constitutionalism that embraces such related topics as civil service reform, party systems, and corruption concerns. 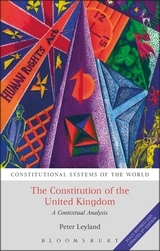 Given it is both stylistic in manner and comprehensive in approach, it should be essential reading for those seeking to understand a constitutional context that has bewildered observers for decades. In effect, it gives readers the information they need to form their own opinions, which so few scholarly works readily achieve. Peter Leyland is Professor of Public Law at SOAS, University of London and Emeritus of London Metropolitan University.